A sunny patio is the epitome of xeriscaping – the warmth of the stones, and the shade beneath them along with the tiny bit of moisture captured is all that tiny ground covering plants like thyme need. Even in areas that get very little rainfall, thyme thrives in these conditions. 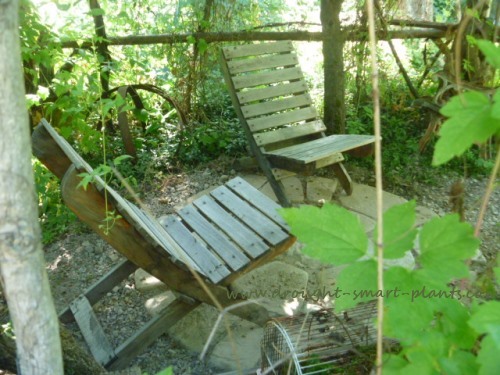 A small area that is flat, level and in the full sun can be a pleasant place to put rustic seating, for coffee or to read a favorite magazine. 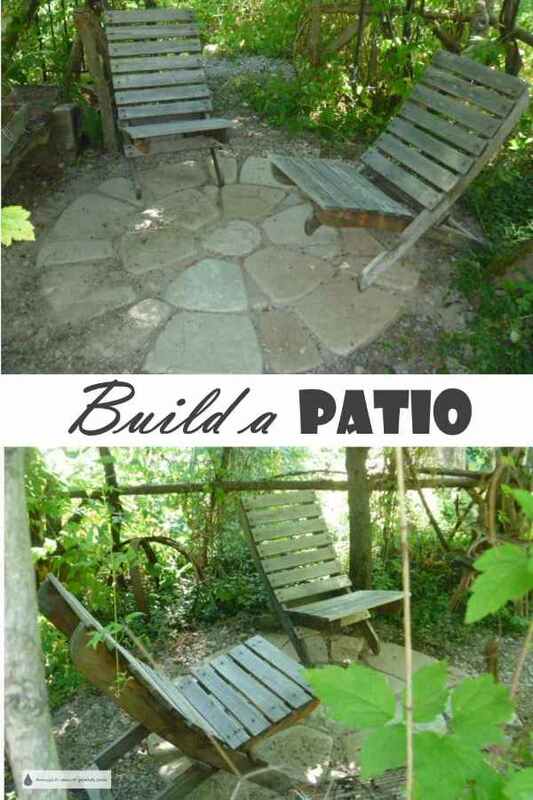 Patios developed out of a need to have a dry place, preferably close to the house but not always, with a place to sit. Some are small, intended for a cozy place for two to have coffee together, or larger, with enough room for a gathering of family and friends. Quite often, they have a fire pit or fire place, always welcome on cooler nights. They always include a seating area or chairs, and this is where your creativity comes into play; there are so many ways to make this kind of place completely your own, reflecting your personality. Here are a few tips on where to start. For two chairs and a small table to hold drinks and a book or magazine you’ll need an area about 2-3 meters (8-10') across, approximately. A dining table with four chairs will require 4-5 square meters (5 square yards) of flat space. Two loungers will take up somewhere in the middle as a space requirement. Make your patio a little bigger than you think you’ll need, as there must be some room for displaying lush containers of plants. String lines help you to visualize the area, or even a garden hose laid out on the ground. Measure the area, and estimate how many pavers or flagstones you’ll need to buy. If you’re making your own diy patio blocks (this link opens in a new window), you can make that determination at this stage. For a unique patio design idea, use the garden hose in a curved line to follow – this will be a free form rustic type of patio, without straight lines. The area must be flat and level. This is crucial. It also should have somewhere for water to drain out of the area, which is particularly important if your soil is clay, and the area is directly outside your door. Barefoot living, where the patio is on the same level as the floors of your house is not as enjoyable when you have to wade through water coming in after a rain storm. Dig down 10-20 centimeters (4-8") and remove the turf, soil and any debris from the area. Make sure you move any larger rocks, as these can cause the flagstones or patio blocks to crack in the winter from frost heaves. Plan on importing a few centimeters of drainage material to cover the area; this can be what is referred to as ¾ crush, a type of screened gravel which because of the sharp edges can be compacted while still retaining the properties of drainage material. Don’t use pebbles or rounded gravel, such as drain rock as this won’t compact well enough. If you have to, rent a tamper to compact your base, or use a hand tamper for small areas. 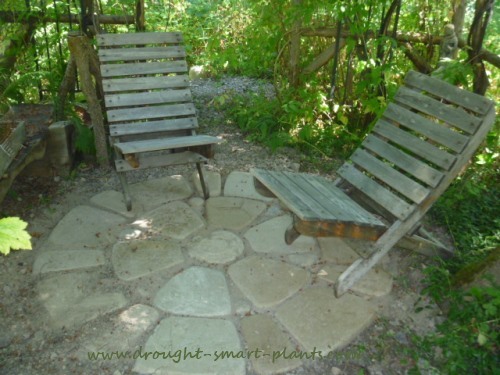 A layer of fine sand or small gravel makes the layer for your flagstones or pavers to sit on. If your flagstones are uneven thicknesses, this takes more time and effort to make the top level, but it’s worth the pain and suffering now. A long bubble level will help you get them all the same. Add a handful of the sand or gravel under areas that need to be raised up. Using concrete pavers or bricks is not as time consuming as they’re all the same thickness. Pour some of the sand over top of the pavers and sweep it into all the cracks. Leaving a bit of room between them can help in the future as it’s easier to get weeds out, or even plant moss, Scotch Moss or thyme into. I recommend planting thyme plugs at the same time you’re laying the stones as this is much easier than retroplanting once the patio is done. Water lightly a few times to wash the sand down into the crevices, and you've finished building your patio. The nice thing about building your own patio is that it’s done, there is no drying or curing time, you can move your patio furniture on it, and enjoy your new patio.